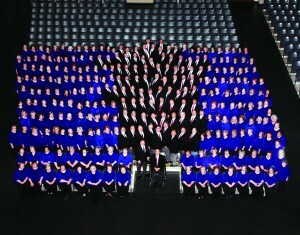 The combined Singing Churchmen and Singing ChurchWomen are shown in the tabernacle earlier this year. DAVIS—Well-known composer Phil Barfoot wrote the song, “The Applause of Heaven,” following the death of his father, Milton, a few years ago, but put the manuscript away before deciding to publish it. Now, the Singing Churchmen (SCM) and Singing ChurchWomen (SCW) of Oklahoma will bring it to life Thurs., Nov. 7 during a 7 p.m. concert at Falls Creek Baptist Conference Center (FCBCC). The concert—which features about 350 singers and instrumentalists—will be the first major use of the Bill & Linda Green Choir Loft in the R.A. Young Tabernacle since the loft was named in honor of the longtime Oklahoma music leader and his wife. Fittingly, the couple will be a part of the historic event themselves as members of the groups. Lind said Barfoot sent a rough draft of “The Applause of Heaven” to him and a SCM leadership team who were selecting songs for a new CD to be recorded by the Oklahoma groups. “The song became the title cut because we felt it deserved to be,” Lind said. “At the time, we had no idea of the history or story of the song. Phil only told me the story after I informed him it was going to be the title cut. At the Nov. 7 concert, the SCM/SCW will officially debut the new 10-song CD, “The Applause of Heaven,” which will be offered to those in attendance for $10. The proceeds from the CD sales will help fund SCM and SCW projects. The two songs on the CD already in print are “The Same Love,” and “Song of Moses.” Both were arranged and orchestrated by Cliff Duren. “The Same Love” was written by Paul Baloche and Michael Rossback. “Song of Moses” was written by Aaron Keyes, Ben Smith, Chris Moerman, Graham Kendrick and Joseph Pat Barret. The Nov. 7 concert at Falls Creek is sponsored by the FCBCC and local area churches. While no guided tours of the conference center will be available that day, BGCO Conference Centers Director James Swain encourages attendees to come early and tour the facilities themselves. “Finally, since this is the 40th anniversary of Oklahoma disaster relief, we encourage our disaster relief volunteers to wear their yellow shirts so they can be recognized during the concert for their selfless service to the Lord,” Lind concluded. The SCM and SCW will join for a second combined concert at 7 p.m., April 10, 2014 at Broken Arrow, First. View more articles by Bob Nigh.